Clearly, Hemingway never attended a Major League Eating competition. 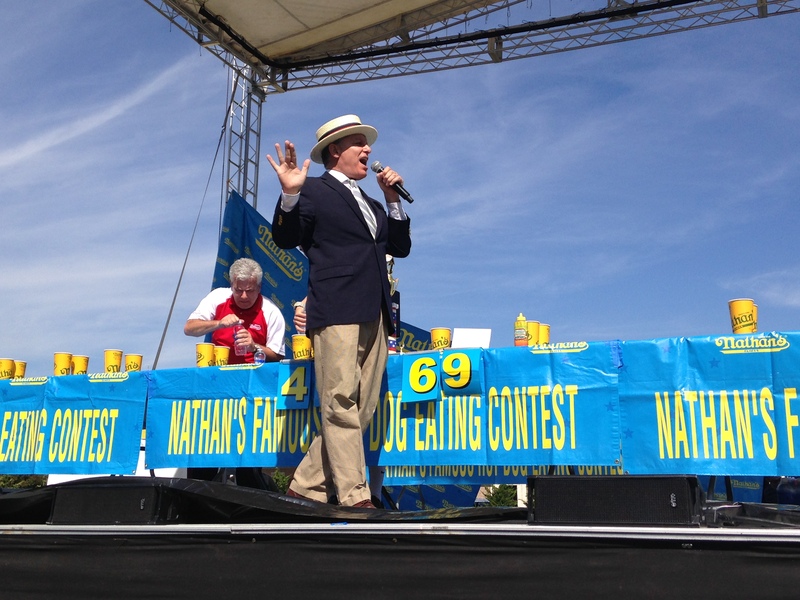 On September 28, Dover International Speedway served as the backdrop for an official qualifying round for the Nathan’s Famous Hot Dog Eating Contest. 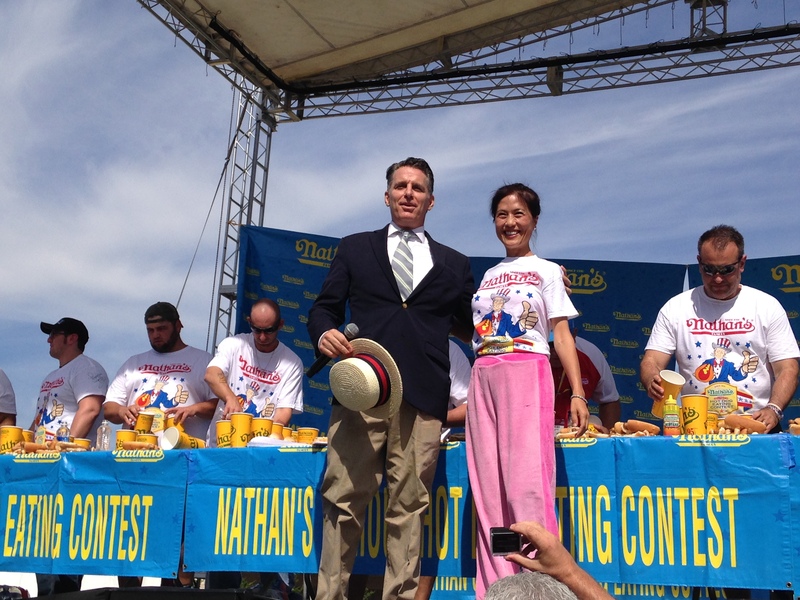 It is only fitting that a place built for speed would play host to the heart-pounding excitement of a 10-minute hot dog challenge, with the fastest male and female eaters advancing to the main event on July 4 in Coney Island, New York. 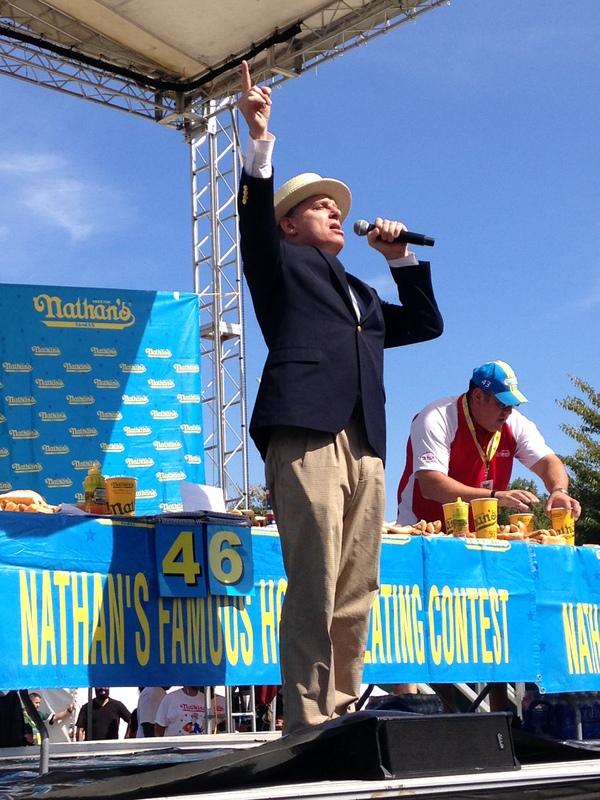 The event had all the pageantry of the annual televised spectacle: the Nathan’s Famous hot dogs piled high on the table, booming entrance music that would make WWE wrestlers jealous, and one of the world’s masters of the microphone emceeing the festivities. George Shea is the world’s greatest carnival barker. No one knows how to work a crowd quite like the voice of Major League Eating. Undoubtedly, he has made himself as much a part of the sport as the hot dogs themselves. With his booming voice and signature straw hat, Shea holds the audience in the palm of his hands. In his words, this is not just a battle between hungry eaters, it is a war between good and evil. Hyperbole and storytelling rules the day when Shea takes the stage. 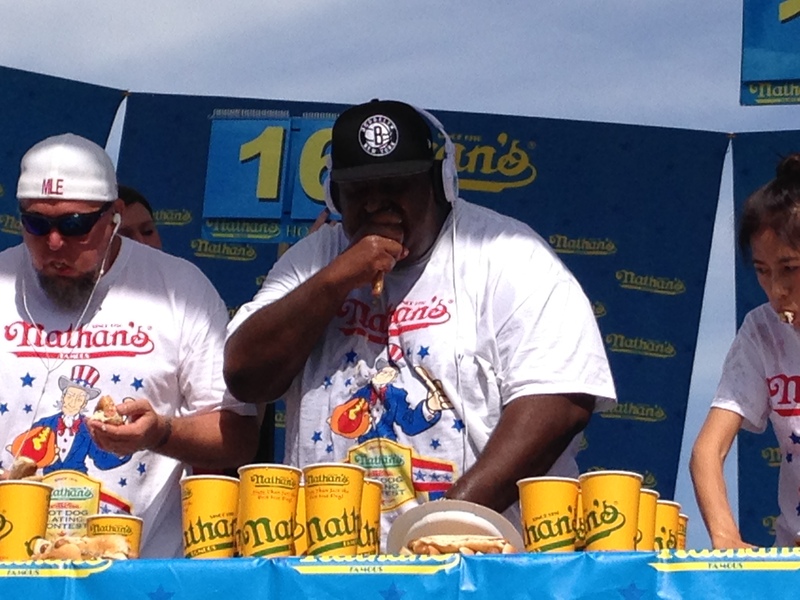 It seems everyone in this contest was raised by wild animals or had to overcome a traumatic eating injury in the past. And then there was Badlands Booker. Real name Eric, “Badlands” was the biggest name in the contest. A yearly fixture of the July 4 contest, Booker is one of the world’s most decorated, with championships in multiple disciplines including matzo balls and corned beef hash. Like Shea, Booker is also a showman. 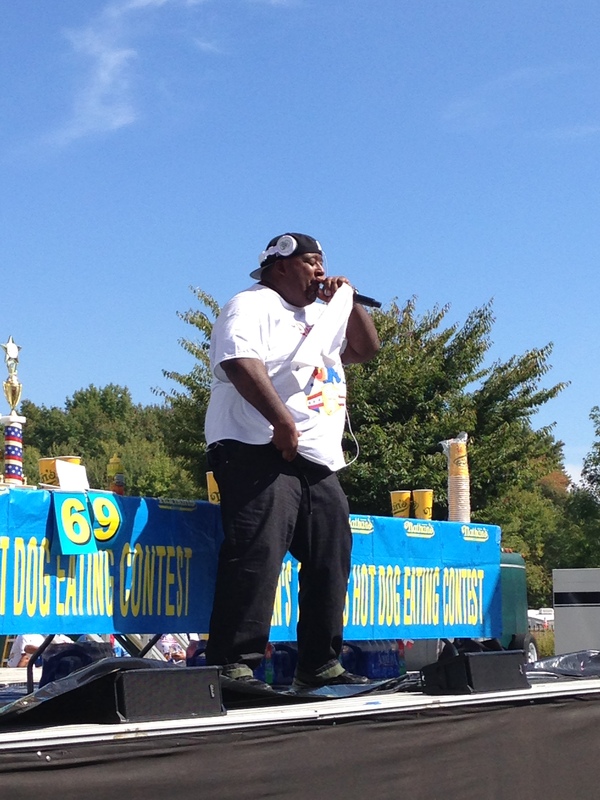 And before the contest began, he took center stage with a pair of freestyle raps. It was at that point that Shea jumped in, “spitting” a rap like they do in Brooklyn (not rapping at all). The pomp and circumstance that surrounds the competition is incredible. 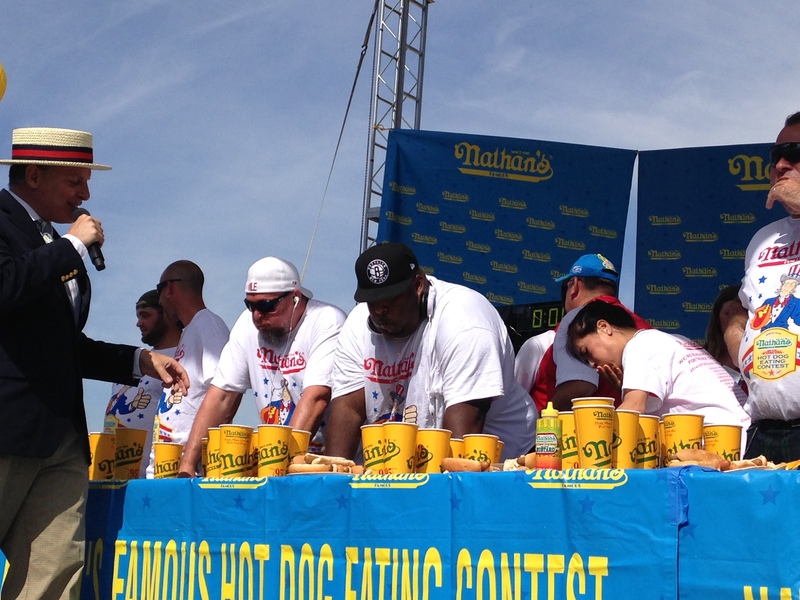 After all, this is 10 men and one woman eating hot dogs. That woman was Juliet Lee, the No. 8 ranked eater in the world. At 105 pounds, she is the antithesis of Badlands Booker. And just as fierce a competitor. When the competition began, the professionals quickly distanced themselves from the amateurs. 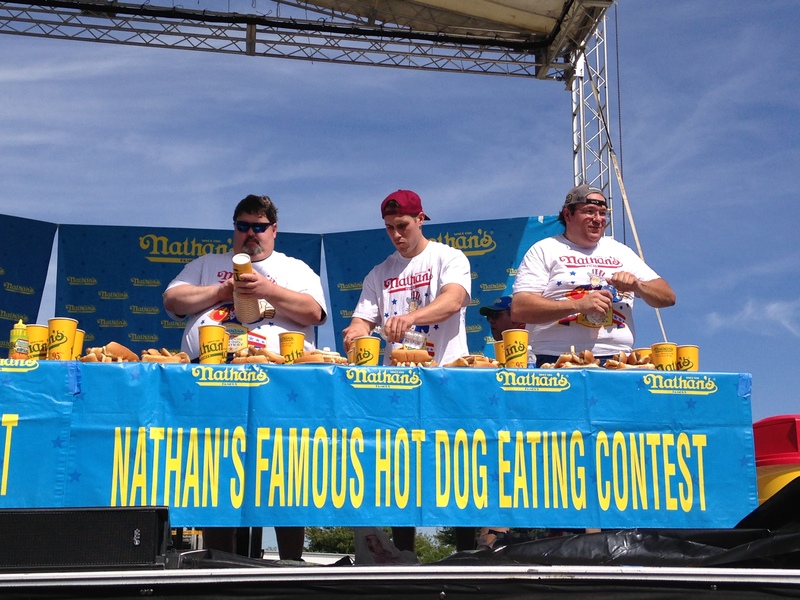 A handful of contestants apparently were just in it for the free food, leisurely downing four or five of Nathan’s Famous hot dogs over the course of 10 minutes. Others tried, but quickly found themselves in the wake of greatness as Badlands Booker pulled out to an early lead. But as the competition dragged on, Booker began to fade, the heat causing him to slow down long before the clock reached zero. While the big man faded, the little woman found another gear, downing hot dogs at an incredible pace. From up close, the competition takes on a whole new level of reality. You can see the eaters struggle as they shove dogs into their mouths. Crumbs stuck to their faces like blonde goatees. When the final buzzer sounds, the judges are left with the unenviable task of counting the remnants, pulling soggy remains out of water cups to determine an official count. It is the least appealing part of the contest, but Shea is there to misdirect the audience, drawing attention away from the orts on the table, and instead placing the spotlight on himself. It is only after the final count is finished that the spotlight once again falls on the competitors. After 10 minutes of fierce competition, two winners have been declared. 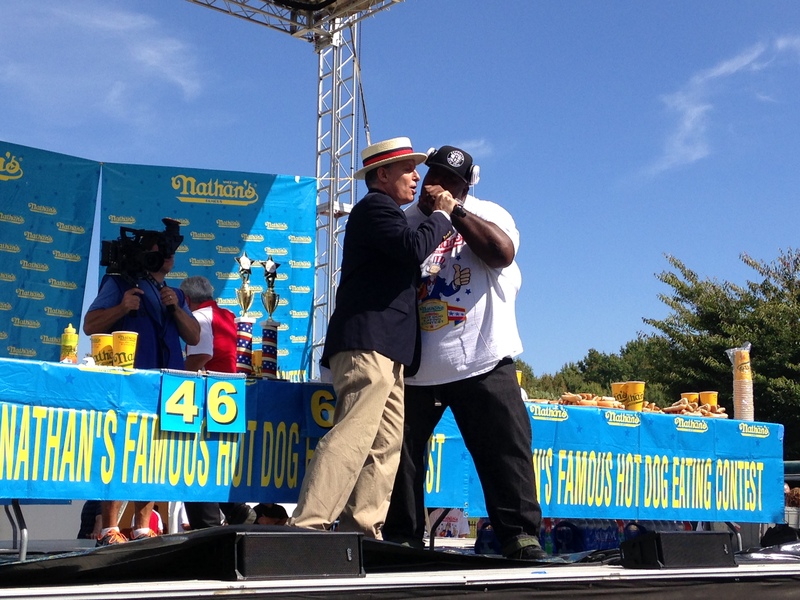 Badlands Booker is the winner on the men’s side with 32 hot dogs, punching his ticket to Coney Island. But it was Juliet Lee who ruled the day, downing 35 dogs in an absolutely stunning performance that would have been good enough to earn the title in last year’s women’s division at Coney Island. Nine months from now, the world will have the privilege of watching Badlands Booker and Juliet Lee take center stage in New York. More legendary stories will be told, more hot dogs will be consumed and more stomachs will turn after turning on the TV.